A living will, often also referred to as a ‘Advance Directive’ or ‘Declaration’ depending on the State, is a form that a person uses to choose their end of life decisions if they should become incapacitated. 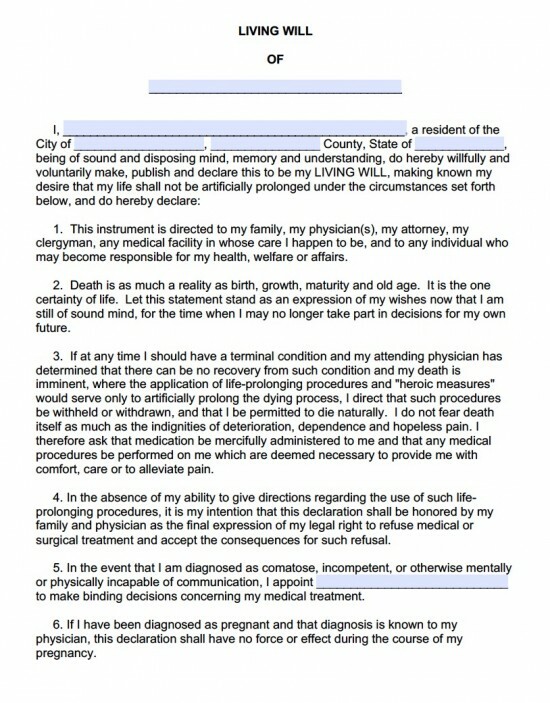 Specifically the document is used to elect their options of whether to intake or not to choose certain life-ending choices such as turning off feeding tubes and breathing devices intended to keep the patient alive. Instead, this option is only available when medical professionals have determined that there is no chance for the person to come back from their vegetative state of mind in addition to death being near and imminent. All forms instruct the physician to induce any and all pain relieving medication so that the patient may be able to not suffer in their natural death. Step 1 – Download the generic living will in Adobe PDF (.pdf) or Microsoft Word (.docx). Step 2 – In the header enter the name of who the living will is for and re-enter in the first blank in the first paragraph. Follow the blank fields and enter the City, County, and State where the individual resides. Step 3 – In Section 5, enter the person to be named to handle any and all medical treatment decisions on the individual’s behalf. Step 4 – On the 2nd page enter the place where the individual (declarant) is signing the form followed by their signature. Below that at least two (2) witnesses should be present during the declarant’s signature and/or a notary public. Step 5 – Once the form has been finalized it should be distributed to all family, close friends, and physicians that are close to the declarant.